The house is entered from the west front, leading into the ‘screens passage’. This is a traditional feature originating in medieval houses: here a gracious hallway that is open to the Great Hall on one side, through a triple-arched screen that divides the two, affording a certain level of privacy, and which leads the eye to the main staircase hall along a fine stone and marble floor. The Great Hall itself also originates in important and great medieval houses; by the time Swakeleys was built it had become the ceremonial heart of the house, where visiting guests would be received. It still enjoys a fine stone and black marble floor and the black marble mullions of the windows are very much in evidence. Traditionally, the screens passage and Great Hall would take up the whole width of one wing; at Swakeleys a dining room is added, producing an innovative layout. The walls of the great painted staircase hall are covered in murals of rich oil paintings of mythological scenes, within a painted, formal, classical, building structure expressed with four great columns and capitals supporting their entablature. These show the Trojan hero Aeneas and Queen Dido, as well as the goddesses, Juno and Iris, on the ceiling. The artist and date are unknown, but this was an extremely fashionable way to decorate grand spaces like this in the late seventeenth and early eighteenth centuries. 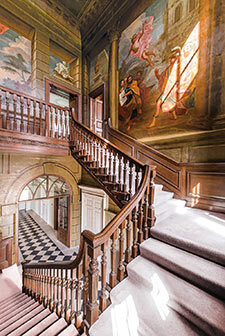 This staircase was designed to lead impressively and principally to the Great Chamber on the first floor, at once the most prestigious room in the house, as a grand entertaining space, and at the same time one of the most private and exclusive rooms, reserved only for the most special, important and honoured guests. Its most interesting feature is the plaster ceiling, which is divided into square compartments by thick moulded beams. When Swakeleys was built, this ceiling would have appeared strikingly modern. 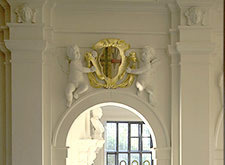 It is influenced by the work of the royal architect, Inigo Jones, whose ceiling at the Banqueting House, Whitehall (1619-22) is also divided by thick beams. The original long gallery led off this chamber.